A recipe for Calypso Pork Chops. 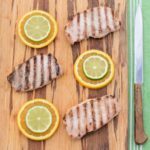 Boneless pork loin chops are marinated with fresh citrus juices, garlic, and spices. Grill and serve with rice and vegetable. Combine all ingredients in a plastic zip-top bag. Seal bag and refrigerate 8 hours or overnight (up to 24 hours). Remove pork chops from marinade. Discard marinade. Prepare a medium hot grill. Grill chops on a covered grill, turning once to brown both sides, about 8 to 12 minutes. Grilling times vary depending on thickness of chops. Cooked chops should have an internal temperature of at least 145 degrees F.
Alternatively, grill or broil chops using a grill pan or oven boiler until done. Total time does not include time for marinating (8 to 24 hours).